In the past few months, we have covered a bunch of plugins that 3D printer owners can use to share their 3D designs on their WordPress website. Those of you who know a thing or two about 3D printers are familiar with STL files. Thanks to STL Viewer for WordPress, you can display 3D STL files on your website. The plugin lets you use a simple shortcode to embed a WebGL viewer to show STL files on your site. The current version may not have as many bells and whistles as one would like, but it does the job. Your STL files have to be uploaded to your uploads folder before you can get started. 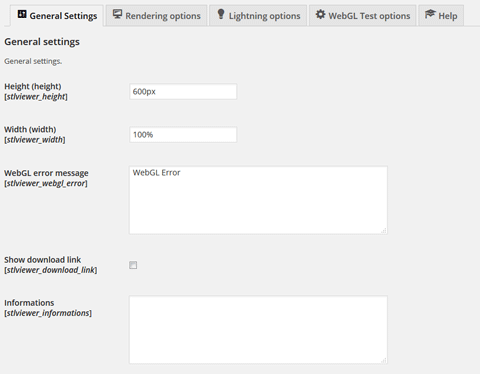 You can change height, width, rendering, and other options from the settings page. As the developer explains on his blog, it is possible to override these options using the shortcode. You don’t have to be a genius when it comes to 3D printers to use this plugin. But knowing a thing or two about 3D modeling and printing wouldn’t hurt. You can try this plugin for free.